The Sacrament of Baptism is the first step in a lifelong journey of commitment and discipleship. Whether we are baptized as infants or adults, Baptism is the Church’s way of celebrating and enacting the embrace of God — the welcoming into Christ’s Church. The Baptism ministry provides a spiritual, educational and outreach service to the parishioners of St. Anne who are preparing for this sacrament. They assist families preparing for the baptism of their children by reflecting on the hopes parents have for their children, the desire to share their faith, and the ritual and symbols of the Sacrament of Baptism. Sessions are offered monthly in the homes of those trained for this ministry. Couples involved meet twice each year for formation and evaluation and generally offer a baptism reflection three to four times each year. Things to keep in mind in planning for baptism. Your child’s baptismal name should be preferably a saint’s name. If the child’s first name is not a saint name, be sure that the middle name is a saint name. There are many secular names that are not acceptable for baptism — those that are foreign to Christian sentiment such as seasons of the year, days of the week, and obviously those that conflict with the Christian faith. The child’s Godparents must consist of at least one baptized and confirmed Catholic; the other may be a baptized Christian. The child’s Godparents must be one man and one woman. If you have questions on these items, please contact Fr. Bob Weighner at rweighner@saint-anne.org. 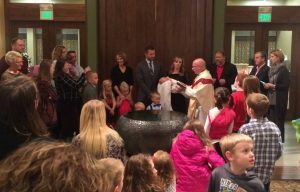 Or, to schedule your child’s baptism, call the parish at (262) 942-8300 or (262) 331-0906.